So you want to farm Adder’s Tongue? This herb is used a lot by players with Inscription who want to find level 70-80 pigment through milling. It’s usually among the cheapest herbs for sale on the auction house as far as Northrend Herbs. It sells best in stacks of 10 and 20 for as much as 100 gold a stack. Check the prices on your realm before you head to Northrend to farm this stuff. You will need level 400 herbalism and a level 75 or higher character. An epic flying mount is preferably but not necessary. Not a lot of players are willing to travel to Northrend to farm herbs, so you probably won’t run into any competition. Update: You can make a lot of gold with Adder's Tongue, but if you want to step it up and make thousands of gold you should read my personal favorite guide. The best place to farm Adder’s Tongue is in Sholazar Basin, no argument what so ever. The best part about farming here is that you will also find Goldclover and Tiger Lily, both are also very valuable herbs. 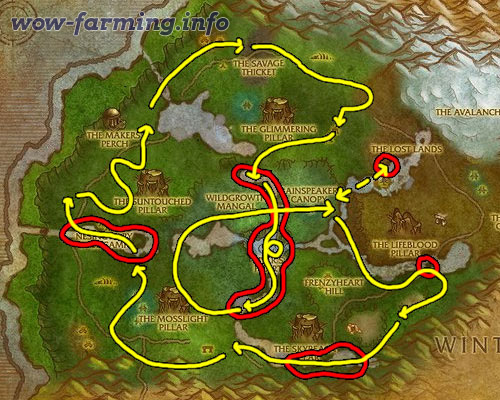 Below is the farming route I made specifically for farming these three herbs. To avoid Tiger Lily just skip the red areas and stay on the yellow line, otherwise follow the complete route and get a really good variety of herbs to sell. Besides Sholazar Basin, you will find Adder’s Tongue in Drak’Tharon Keep and Gundrak. These are level 70-80 instances so you won’t really be able to farm them from there.